Based on the true story of the Hall Of Fame band The Four Seasons, you are introduced to the characters and sent on a whirlwind trip down their memory lane to see the true highs and lows of the bands career. Set against the backdrop of New Jersey you meet all of the people that played a part in creating, promoting and being part of the band that we know today. Whilst we all know and love this show as a musical, I think it’s fair to agree with the creators of the show who have stated that it’s not just a musical. It’s a play about musicians, set to a backing track of their most beloved songs. It’s full of fun, heartache, sadness and joy with everything else in between. It’s a show that appeals to the masses and is still full of themes relevant today. The show itself is split into four seasons, each one narrated by a member of the band. As a result you get a unique insight into their points of view, how they felt everything was going as a band and ultimately how they felt things fell apart. Done in a chronological order, you learnt about their formation, signing and fallout. It’s worth noting that the show is incredibly fast paced throughout the first half of act 1, this allows you to get to grips with the background and basics. But once the band have been signed, the pace is much slower and you really get to understand what happened to this group. To say that this show was slick was an understatement. From the precise perfect singing and harmonies that literally left the audience speechless, to the fantastic chemistry on stage that made you feel like they had been playing these roles for 30 years. I was even blown away at how seamless the band moved around the stage, with the drummer not even missing a beat as he swept across the stage on a platform. You could truly see that the cast worked in such unison that you honestly couldn’t have cast it better if you had tried. Simon Bailey treated us to a mean yet caring imitation of Tommy Devito, the man that’s the self-proclaimed starting point of The Four Seasons. Whilst Lewis Griffiths kept me laughing as the silent Nick Massi, who only seemed to utter something when he wanted to leave the band. 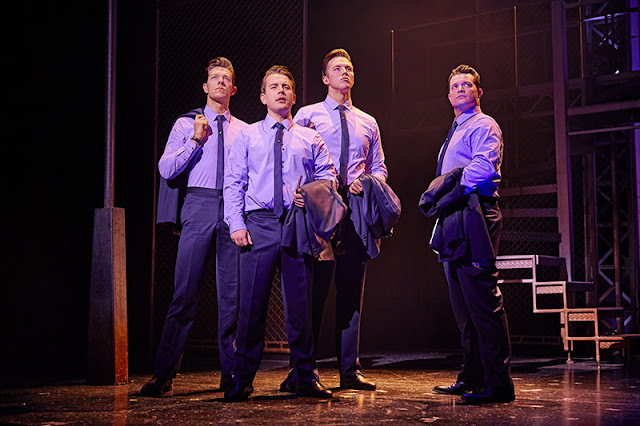 Both Declan Egan and Michael Watson as Bob Gaudio and Frankie Valli blew me away. From their mannerisms to their singing, it was something to truly be marvelled at. Their partnership on stage was utterly brilliant. Similarly, the small female cast that were so adaptable and ever changing to their roles just shows the level of experience that this cast had. It was as if we had been transported to another time before our eyes. 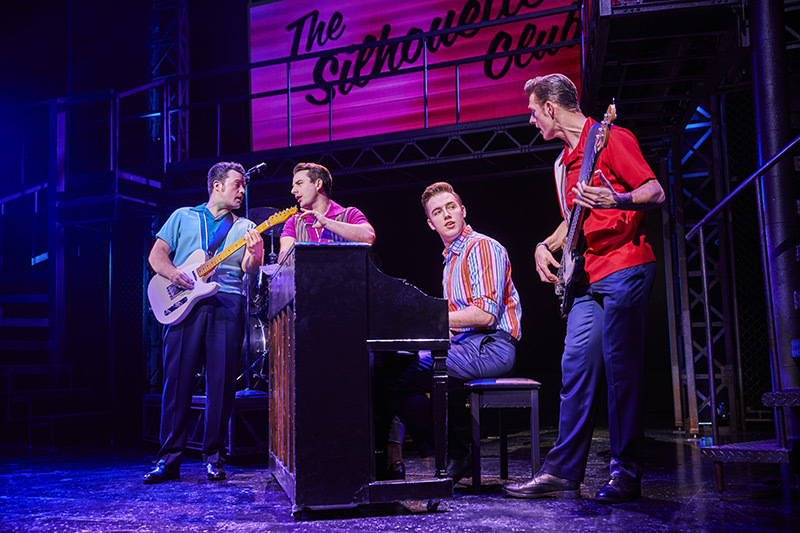 Jersey Boys is a show that can appeal to the masses. Not only will you sit there shocked when it hits you that what is happening on stage is based on a true story, but also how they manage to condense 30 years into less than 3 hours without missing anything important out. It’s amazingly paced and it flows brilliantly. 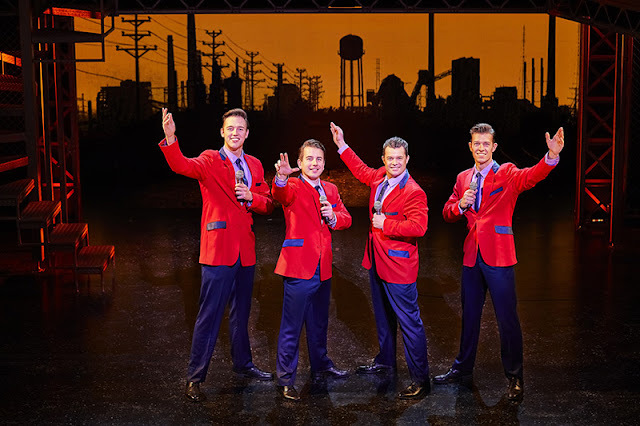 Whether or not the music of Frankie Valli and the Four Seasons is something you are interested in or not never takes away from the fact that this show is timeless. There will be something for everyone young and old to recognise and dance along to in their seats. It’s a must see show that will leave you appreciating this complex tale of music and the downfalls of fame. Jersey Boys is on at the Mayflower Southampton until the 30th March and you can buy tickets.